PARK(ing) Day is an annual and international event that SF has participated in since 2007. Along with thousands of other individuals spread throughout the globe, on PARK(ing) Day we reclaim the 120 square feet of space, which is labeled every other day of the year a parking spot, into a small but powerful public place for the community to enjoy. With so many families and young children in the Flatbush neighborhood, SF’s “Cortelyou Road Park” was a place full of child’s play. 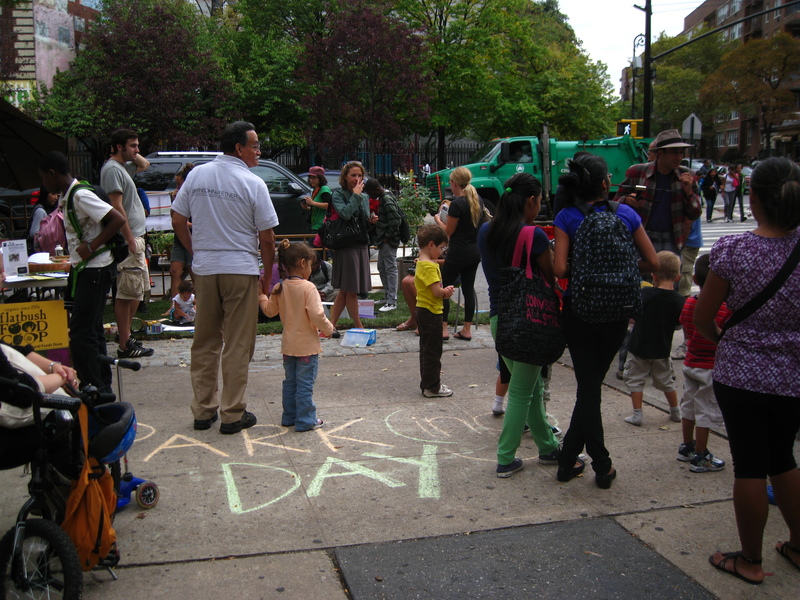 From puppets, to painting, to percussion, PARK(ing) Day 2010 entertained the young and young at heart while sending a clear message about the need for increased usable public space in Flatbush. 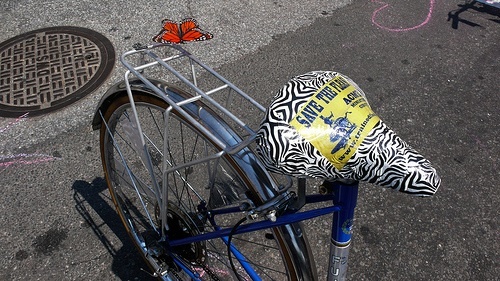 July 18 2010: Traffic Calming Block Party Organized by SF and executed with the help of local volunteers, the Traffic Calming Block Party raised awareness about the importance of ensuring that our streets are safe for pedestrians and bicyclists. With live music, bike decorating, sidewalk chalk drawing, and tasty food and drinks provided by the late (and lamented!) Vox Pop Café, this event had all the fixins’ of a summer block party. Helpful NYC biking guidelines provided by Transportation Alternatives and a pedestrian survey engaged guests in a discussion of street safety, particularly on Cortelyou and Stratford Roads. These surveys will be compiled to create a study that can be used to advocate on behalf of the community’s needs for safer streets. 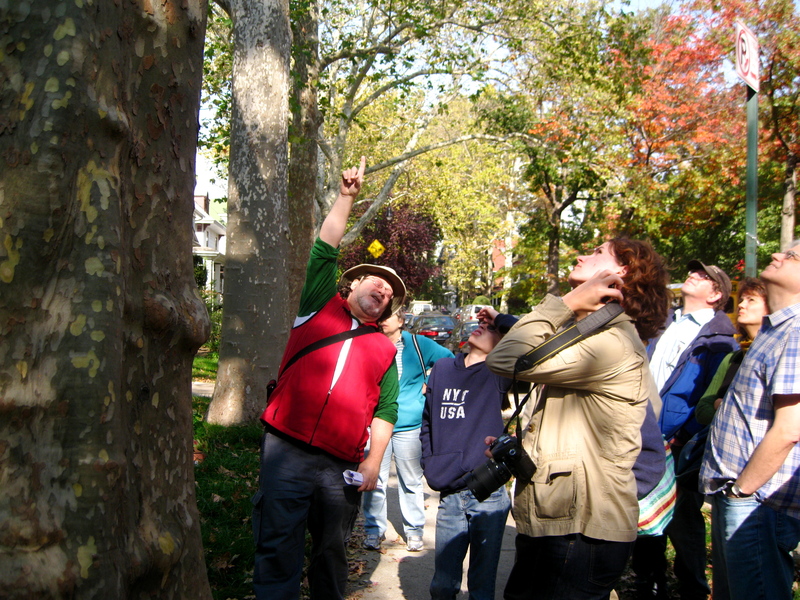 This spring we held our fourth Street Tree Walking tour, now a semi-annual event. Local horticulturists Chris Kreussling (aka Flatbush Gardener) and Tracey Hohman led residents around Victorian Flatbush by foot, while giving a thorough account of the diverse local canopy. This event reminds us that streets are not separate from nature, but can in fact be places where one can connect to foliage. In addition to increasing knowledge and appreciation of the local environment, the walking tour impresses upon residents the important role street trees play in absorbing stormwater runoff, as well as filtering air pollutants released into the atmosphere. More recently we hosted the fall complement to the Street Tree Walking Tour series in late October. It was a beautiful Sunday afternoon and participants were guided along the streets of Flatbush by Chris and special guest Sam Bishop, Education Director at Trees New York. Sam and Chris described the identifying features of various tree species as well as some of the urban planning history that has shaped the current canopy. With over forty participants total, the fall walking tour was certainly a success! And as residents, we have the right to a voice in how that evolution transpires. Street Tree Walking Tour, Saturday 4/25/09!